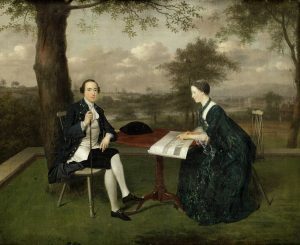 James, 20th Earl of Kildare and his wife Emily Mary in the grounds of Carton, by Arthur Devis from the collection of the Duke of Leinster, sold for 262,000 euro at Bonhams Old Master Paintings sale in London on July 4. It had been estimated at 80,000-100,000, and was one of five works from the collection in the sale. They made a combined total of 510,215. The painting shows the Earl and his wife seated in the garden of the new family seat at Carton House in Kildare, commissioned by his father in 1739. The Countess is portrayed holding the plans for a bridge. Bonhams Representative in Ireland, Kieran O’Boyle, “These five beautiful and important pictures from the collection of the Duke of Leinster created quite the buzz when Bonhams announced their inclusion in today’s Old Master Picture sale. That interest translated into spirited competition among bidders on the telephone and in the room, seeing all five sold, with the wonderful double portrait by Arthur Devis”. 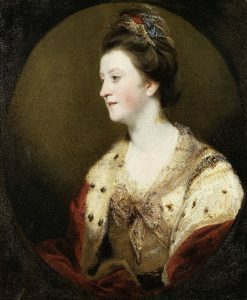 Portrait of Emily Mary, Duchess of Leinster by Sir Joshua Reynolds (1723-1792), sold for 92,215. Portrait of Emilia Olivia, Duchess of Leinster by Hugh Douglas Hamilton (1740-1808), sold for 50,000. A pair of Views of Maynooth Castle by William Ashford P.R.H.A. (1746-1824), sold for 106,000. This entry was posted on Thursday, July 5th, 2018 at 7:47 am	and is filed under ART, AUCTIONS. You can follow any responses to this entry through the RSS 2.0 feed. You can leave a response, or trackback from your own site.